Has Time Run Out on President Bush's Surge in Iraq? President Bush is receiving a deluge of reports and advice, as Congress holds hearings. Military leaders, government agencies and outside experts are analyzing every aspect of the troubled war in Iraq. With little progress in quelling the insurgency and thousands of Iraqis being killed or forced from their homes each week, many politicians are demanding a phased withdrawal. Also, Germany breaks up a terrorist plot against American interests and, on Reporter's Notebook, professional athletes spend their whole lives preparing to win. How should they act when they lose? Jim Sterngold guest hosts. 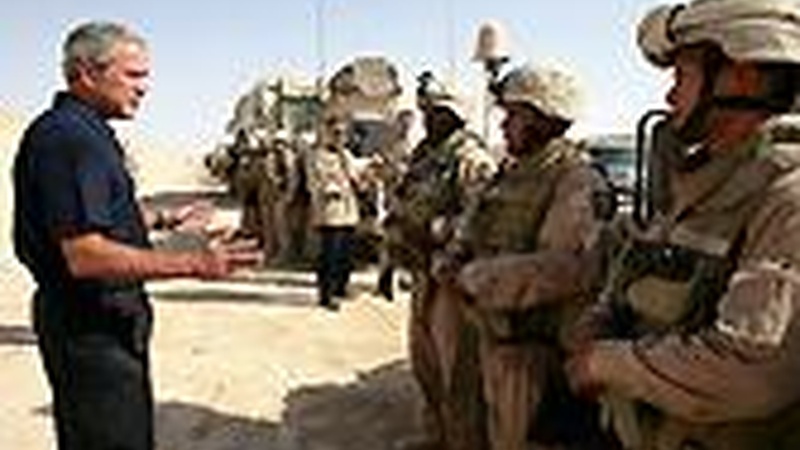 President George W. Bush speaks to members of the Regimental Combat Team-2, Marine Wing Support Combat Patrol at Al Asad Airbase, Al Anbar Province, Iraq.